Happy Monday, Dear Friends! I hope you all had a good Mother’s Day weekend! I actually took things easy over the weekend! Being outdoors did me good. 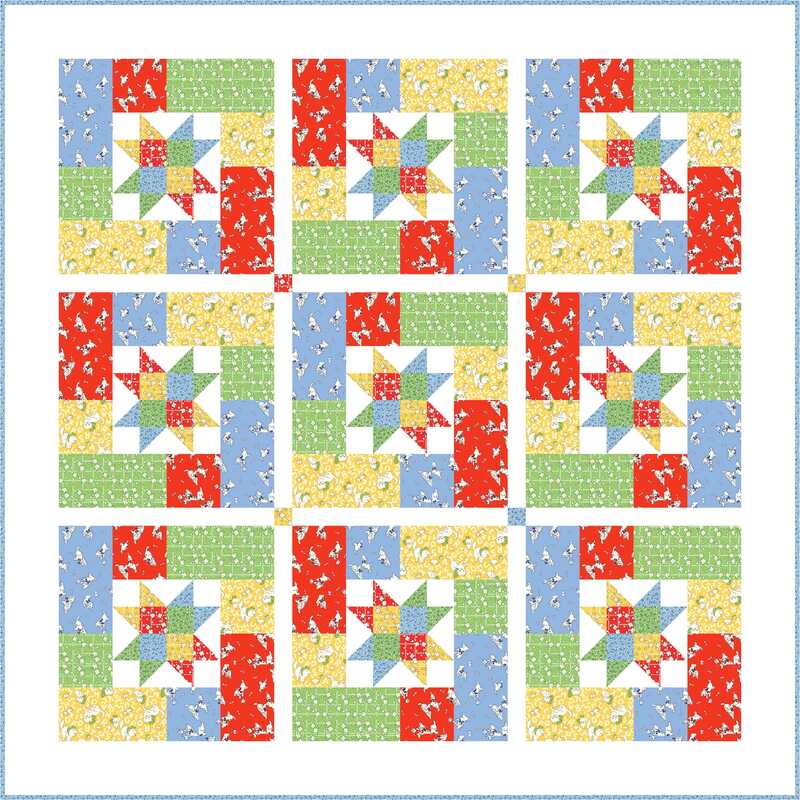 I am happy to share with you a baby/crib quilt design today, using Quilting Treasures’ newly released Baby Sprinkles fabrics. 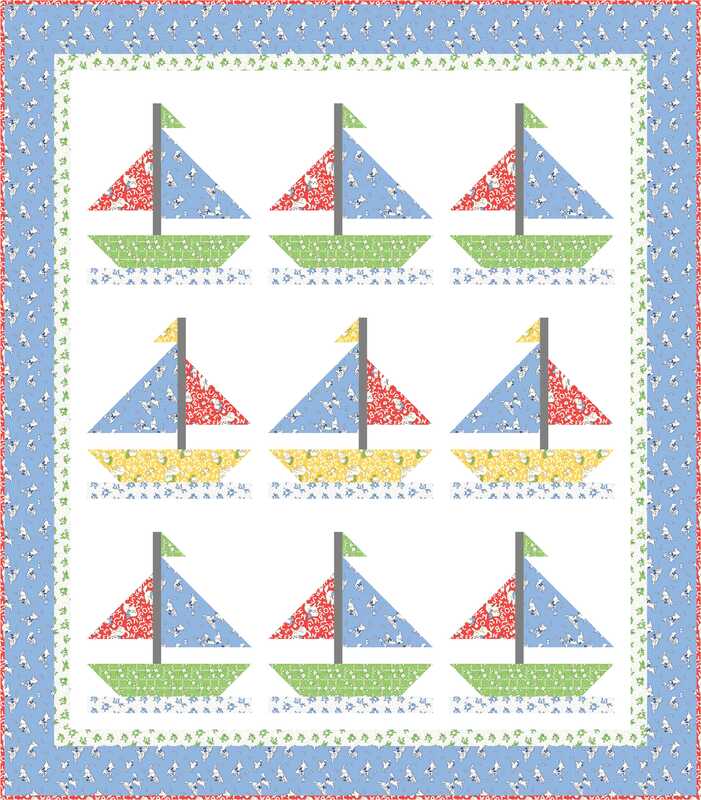 If you like traditional baby things with a fresh take, do check out the Baby Sprinkles fabrics here. I like that the fabric line comes in baby girl and baby boy colorways. 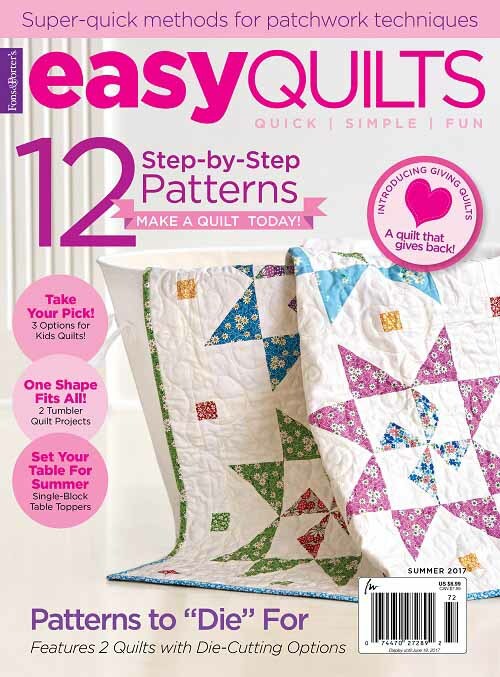 Click here to download the free-to-use pattern instructions. 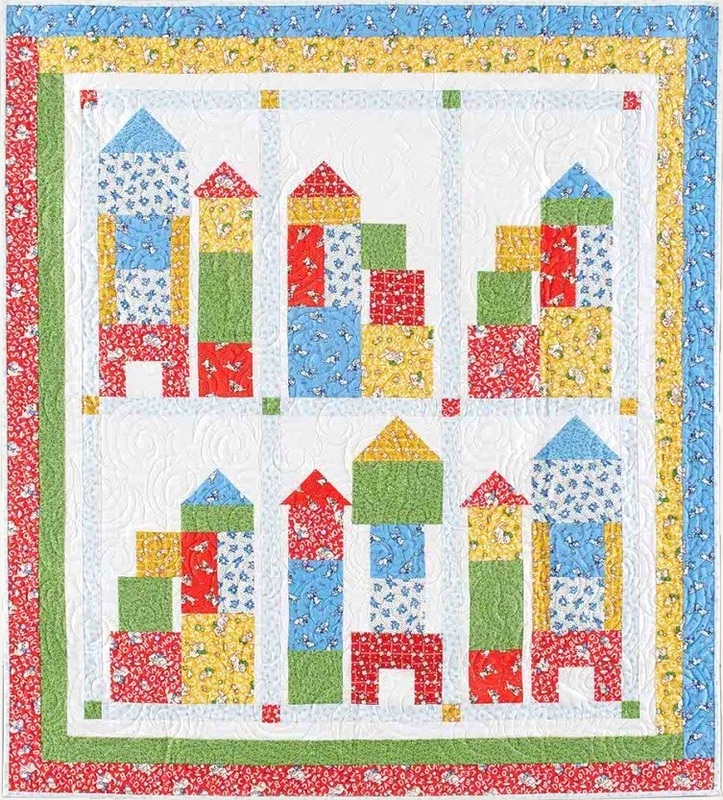 I hope you have liked seeing these sweet crib quilts. :) They make me miss Miss Baby’s baby days — but then, they also make me not miss those early days, ha! Thanks for stopping by. Have a lovely week! 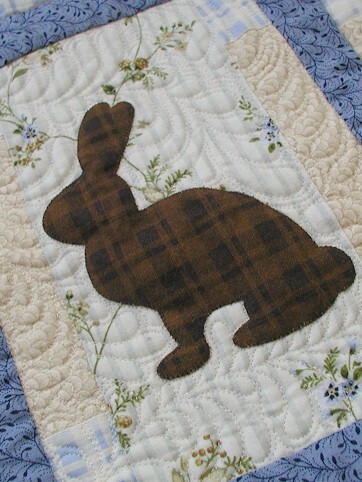 I have actually posted bout my Bunny Foo Foo quilt that is featured in Fons & Porter’s Easy Quilts for Kids (Summer 2011). 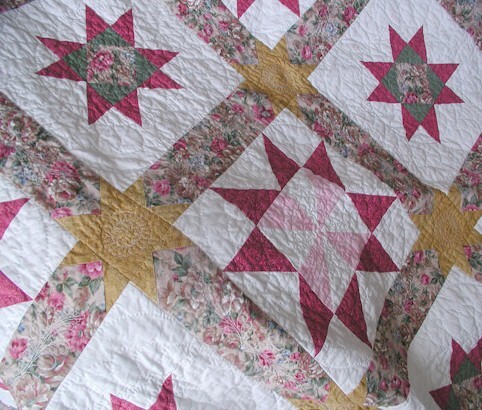 Back when I posted about the quilt, the quilt was not yet returned to me from the Editor, and thus the limited pictures. 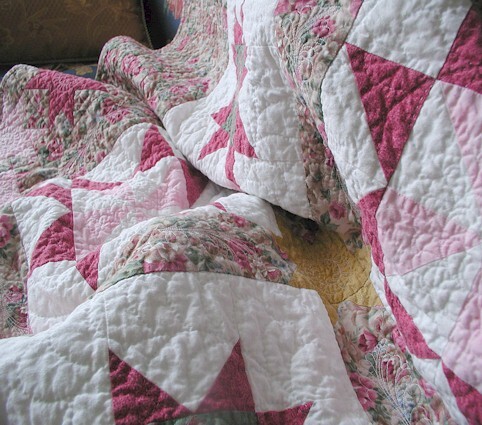 The quilt is back with me now. 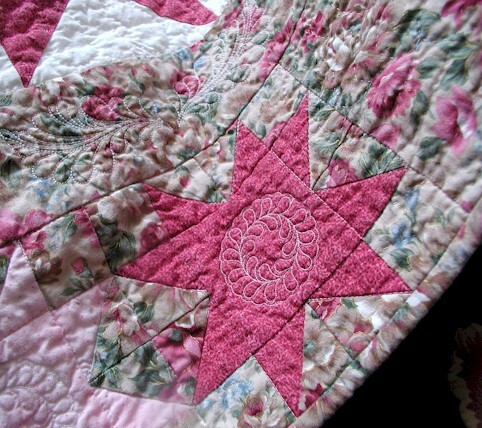 I thought it good to show you additional pictures of the quilt. 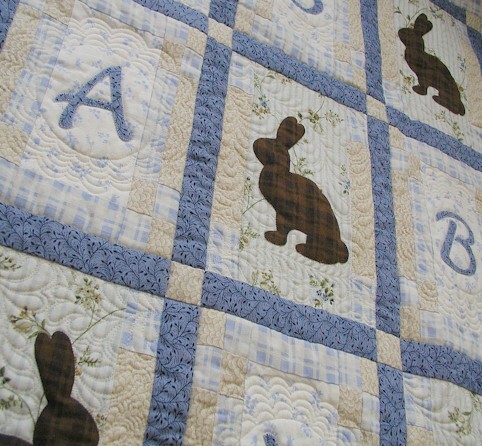 Of course, the quilt wouldn’t be named “Bunny Foo Foo” without the bunnies taking the center stage. These chocolate bunnies make me crave for chocolates. 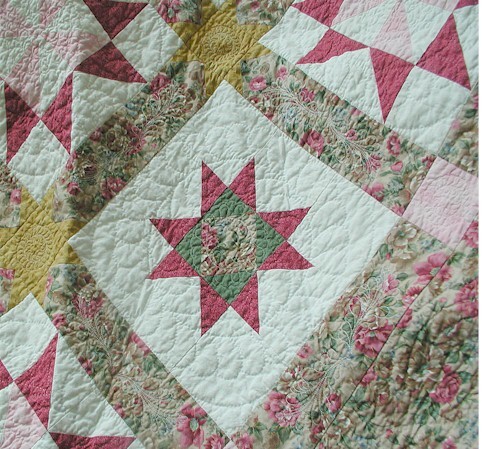 Here are some close-ups on the quilting. 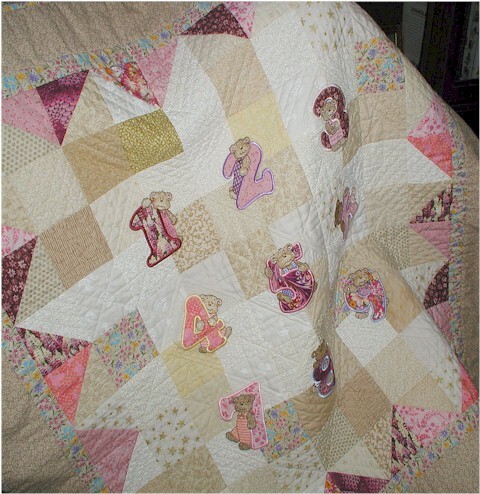 I was very pleased with the “doily” effect I had quilted around the letters. 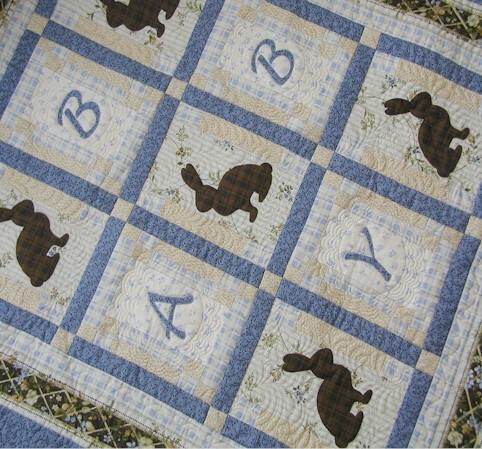 Joan of Australia took the basic layout of the quilt design and made a version of the quilt that is totally her own for her newborn grandson. 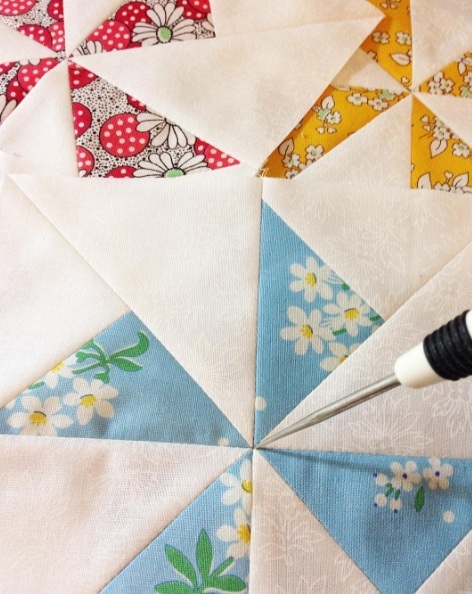 Joan is one of the most creative quilters I know… spend some time on her blog and drool over her work! This week, you have seen the “retired” baby shoes. 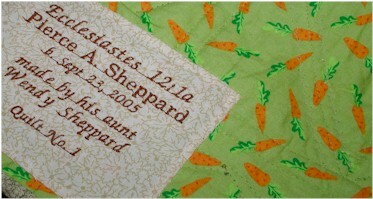 You have seen the work-in-progress Birth sampler for Baby. 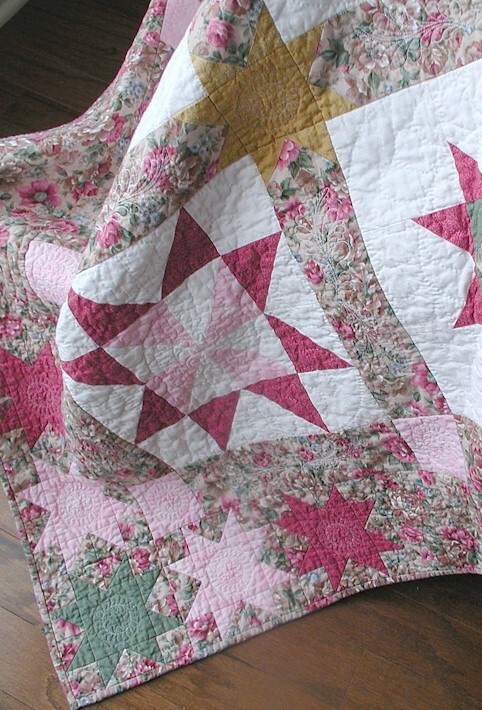 And now, without further ado, Baby’s official baby quilt, Gwen’s Stars – made by Barbara! 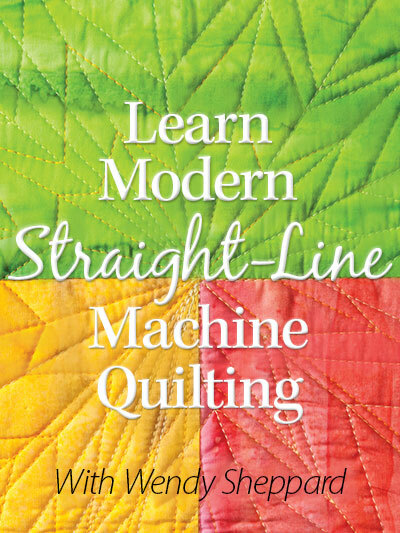 I have often mentioned Babara, my ever wonderful quilting teacher and beloved friend, who got me started down the exciting path of quilting. 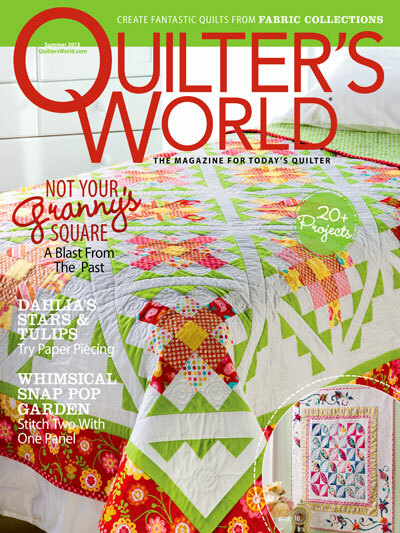 She brought by a quilt she made for Baby last week!! Friends, we are extremely touched by the gift at the Ivory Spring household!!! 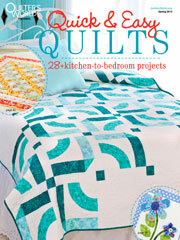 To date, I don’t know of any quilt holds a more honored place in our home and hearts! 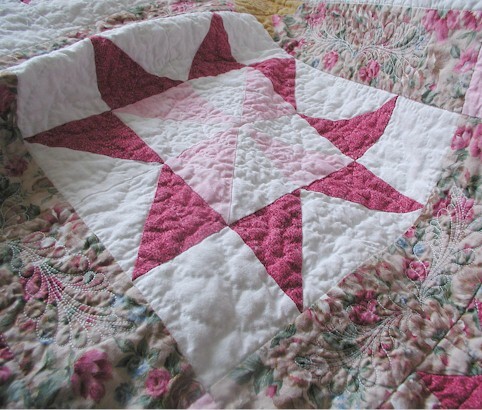 Barbara used the Martha Washington stars in some of the blocks because she knows I am a big fan of Martha Washington. The colors are the perfect! They convey the right amount of femininity that I hope is evident in Baby when she grows up. I absolutely love the touch of gold amongst the pinks and greens too. 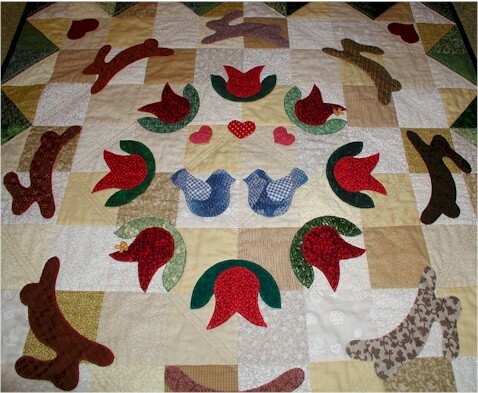 Barbara quilted the quilt with a mix of machine embroidery and hand quilting (the major portion). It is amazing!!! 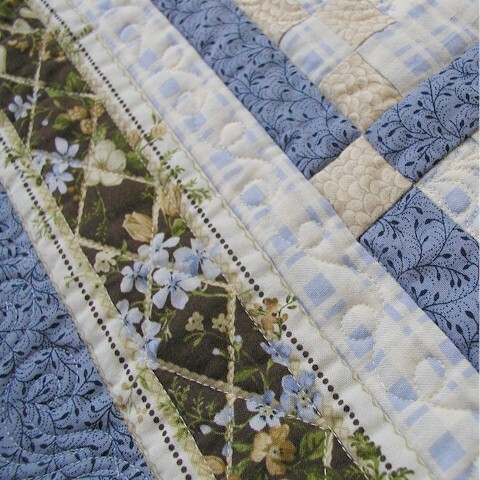 I love the look of hand-quilted quilts – hand-quilting really softens the look of a quilt as a whole. 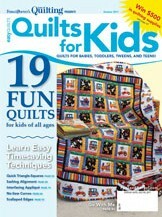 I cannot hand-quilt to save my life. 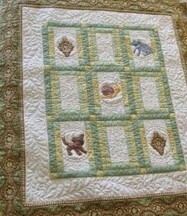 So, I doubly and triply appreciate Barbara for handquilting those beautiful feathers on Baby’s quilt. 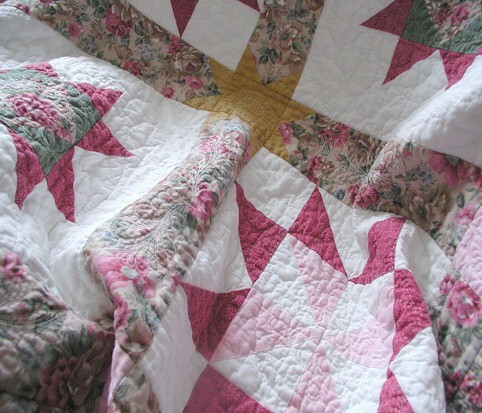 I know this quilt has been a work of love and prayers. Barbara prayed for Baby even before Baby was born. What an honor it is for Baby to have Barbara in her young life! 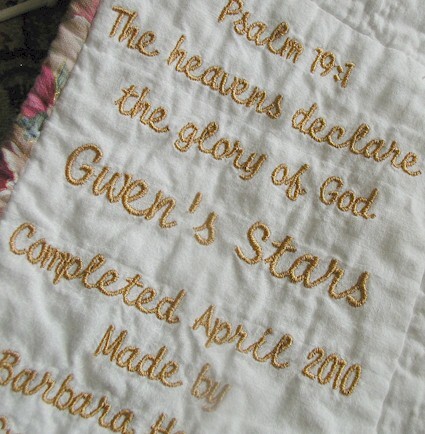 Barbara named the quilt “Gwen’s Stars”. 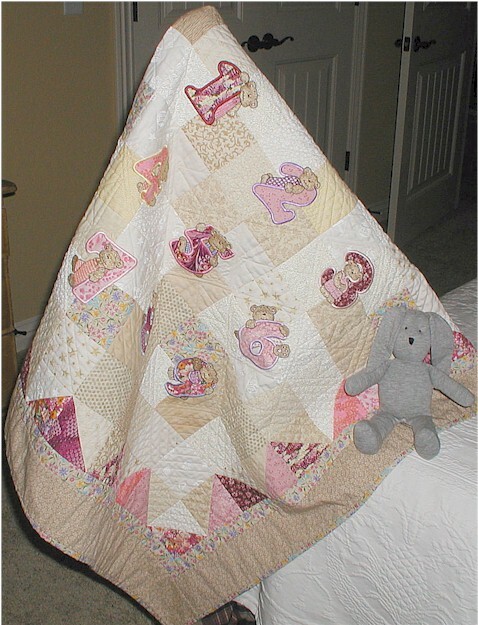 A most giving and generous person, Barbara has blessed countless babies with baby quilts — we think she is the REAL star! 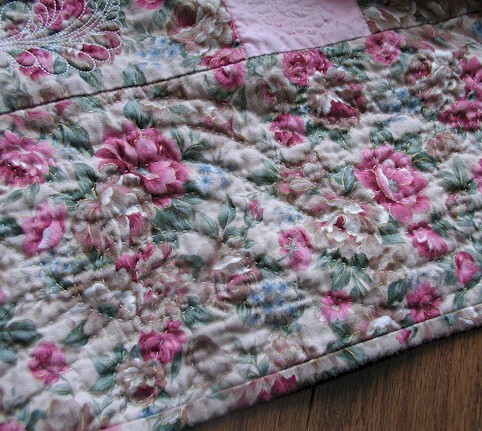 It was not easy stamping a 7-month old’s footprints on the quilt top. At first, the baby was really curious. 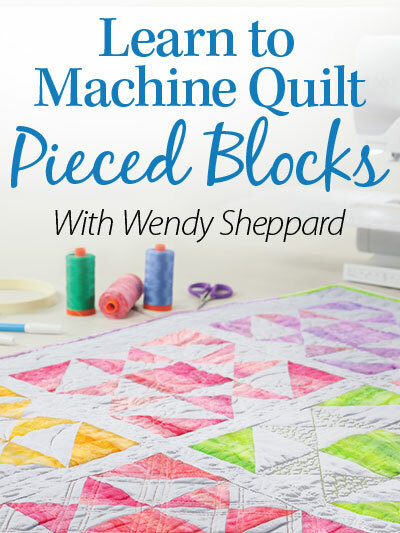 But curiosity eventually killed the patience toward the end of this mad scheme of getting a 7-month old baby to cooperate in stamping her footprints on a magazine quilt top that really has very little room to mess up. But I think we all survived! This is a busy day for me, but this is the day I get to attach the collars onto my daygown! EXCITING. I can’t wait to show you pictures when I get those collars on! I hope wherever you are, you would have a safe and blessed day! 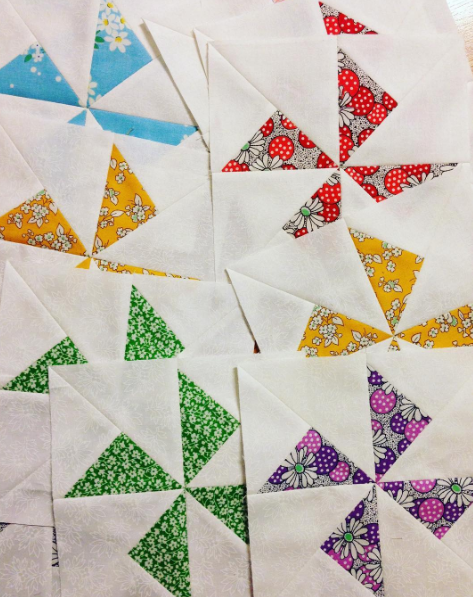 People ask if I sell my work… my answer is always, “Why, of course!” From time to time, I do put some of my quilts up for sale to go to a good home. 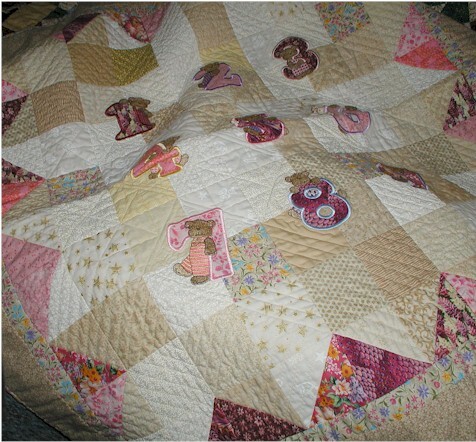 Currently, I am offering “Count Your Blessings” – a baby girl heirloom/blessing quilt that is custom-made with over 30 fabrics all mixed in together for a girlish whimsical look. 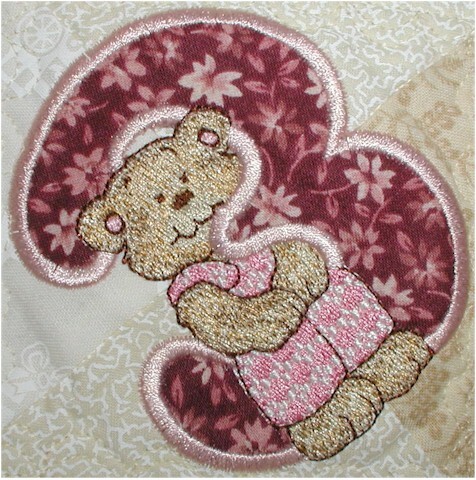 There are nine girl bears that are appliqued onto the quilt with machine embroidery. 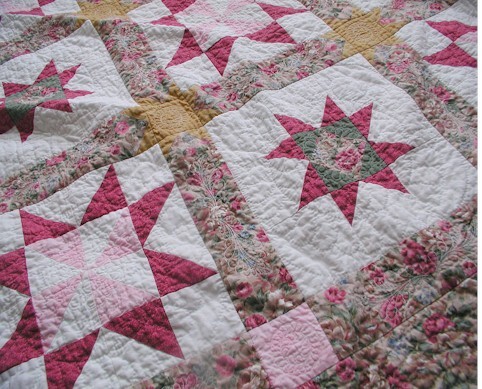 Only the 100% genuine quilting fabrics were used, with Italian and German made threads for the assembling the quilt. Everything is done by yours truly! Finished size is 36.5″. You may click here to access my shop page. 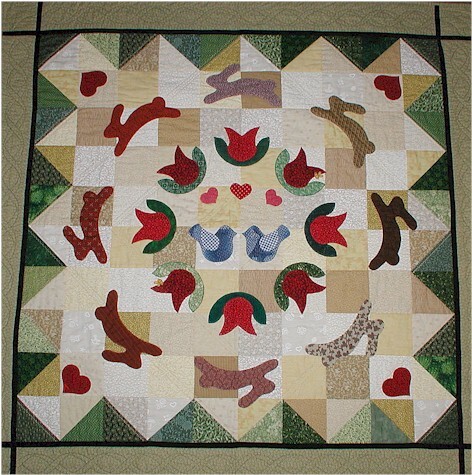 There is only ONE of this quilt for sale offered at a much lower price than a custom-order quilt in the same style, so the sale is on a first come first served basis. 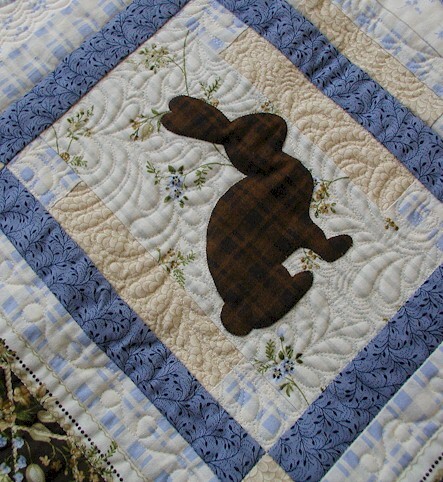 I am able to do custom orders for quilts in this style should you be interested in having one made for a boy. 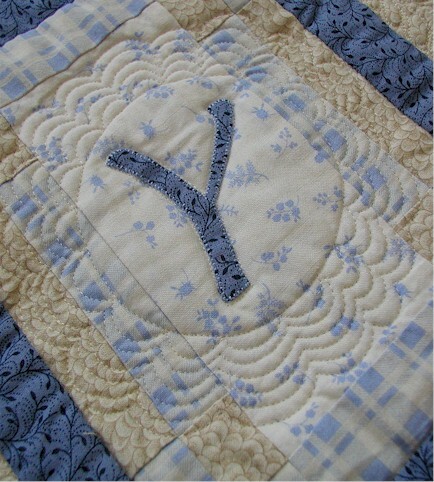 I am also able to do the applique for letters to make the name of a child, or even all 26 alphabets. 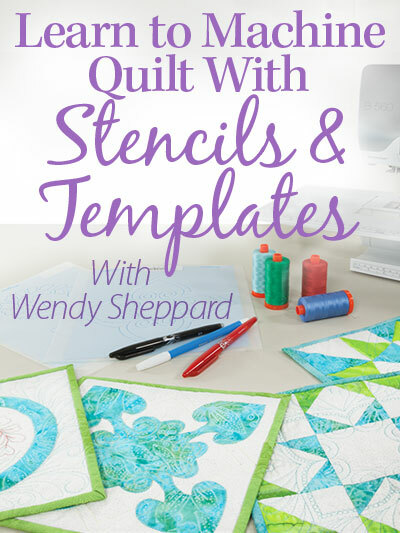 Please do not hesitate to contact me for pricing at wendy@wendysheppard.net should you be interested. I am also planning to offer some custom made Children’s Items in the very near future, brought to you by an extremely talented lady (NOT ME!) who specializes in children’s clothing. Come back tomorrow when I do a show and tell on a Christening gown she has made that is now in my possession. 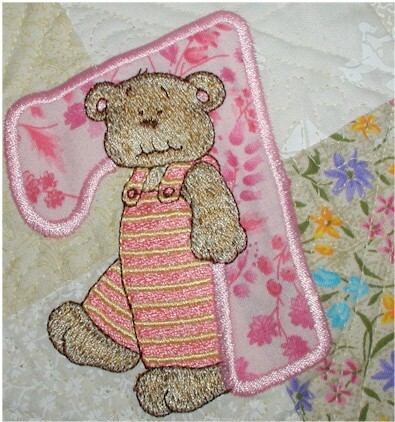 The bear motifs are from a collection called Alpha Bears. My favorite part is being able to use my own colors to “dress up” these girly bears in their favorite outfits! I hope you all have a very blessed week ahead of you!! It’s always wonderful to have you stop by. Do drop me a line so that I can visit you too. 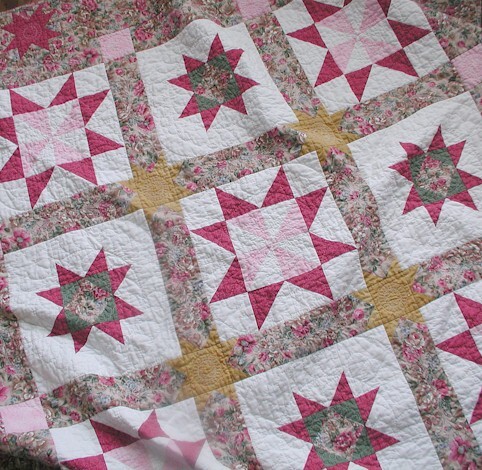 I made my first quilt after much encouragement from my quilting mentor and friend Barbara. I had the perfect excuse to venture into something new — a newborn in the family! Have a fun weekend, everyone!